DICE: Graphical Parity On All BF4 Versions is "Coward's Way Out"
The game will look very different on current-gen and next-gen platforms. Battlefield 4 on the Xbox 360 will look different to Battlefield 4 on the Xbox One. This is a seemingly obvious thing to say, but DICE have gone out of their way to stress that the game will be tailor made for the specifications of each platform it will release on, as making each version of the game look the same graphically would be the "coward's way out". "You could take the coward's way out, and just set the bar at Xbox 360 and PS3, and make it so that all games look the same on all platforms, but that's not who we are. We want to do our best with the hardware." Battlefield 4 executive producer Patrick Bach, speaking to OXM, said that even with Battlefield 3, a lot of players would "nag" and complain to the developer about why the PC version was graphically superior to the console versions. "You had a game that looked amazing on PS3 and Xbox 360, but it didn't look as good as on PC, and people kept nagging us about that." Bach says this isn't fair, and that players should instead "compare it to other games on the same platform," rather than comparing versions across platforms. 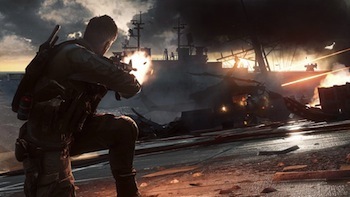 He says his team is really pushing the PC and next-gen console versions to their absolute limits with Battlefield 4, while still making sure that the Xbox 360 and PS3 versions look the best they can, and are a clear step up from Battlefield 3. Which platform will you be getting Battlefield 4 for? If you're considering getting it for the PC, you may want to check out the open beta that's running, and if you want to get it for your current gen console and upgrade to next-gen in November, you'll be able to do so for as little as $10.